At forty-six, Cheryl Fines is finally indulging in a lifelong love of writing, experimenting with many different formats of poetry and prose. She has written a number of short stories and flash fiction pieces, is working on a novel, and has dabbled in a wide range of poetic forms. After years of being a stay-at-home-mom, she is embarking on a new career with her return to university to study Education, which will provide her the opportunity to share her enthusiasm for literature and writing with young people. If you haven't done so already, check out Cheryl's award-winning story "Destiny Darjeeling," and then return here for a chat with the author! 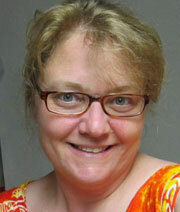 WOW: Congratulations on placing in the 2011 Spring Flash Fiction contest! Where did you get your inspiration for your story, “Destiny Darjeeling”? Cheryl: I was thinking back on a psychic fair I attended a long time ago. There were many different kinds of psychics there, as there were in my story. I am not a believer in any of them, but there were a lot of people there who seemed to be taking it all very seriously. That comes back to me from time to time - I wonder how so many people can have faith in such things ... and then sometimes I wonder what would happen if there really was something to it. It was one of these moments that prompted the writing of the story. WOW: Wondering “what if” is a great way to get a story started! What prompted you to finally indulge in your lifelong love of writing? Cheryl: I'd decided to return to school to become a teacher. My first degree didn't have the courses I needed for admission to the program, so I returned last year to take four English literature courses, and a history. Both subject areas were writing-heavy. I was enjoying writing so much (though of course a different style of writing altogether) that I wanted to write strictly for my own enjoyment. I found WOW - and flash fiction - and challenged myself to write a few pieces. I've since also joined a couple of online writing communities, and really appreciate the feedback and supportive environment in them. WOW: We’re glad you found us! What do you like best about fiction writing? Cheryl: The freedom. With fiction, you have so many choices about voice, dialect, story of course, genre, format ... it strikes me that there is always so much to write - I can't imagine running out of inspiration. Flash fiction is a very tricky format for me - being succinct does not come naturally to me at all. The added challenge of keeping within such a few words - trimming the excess, wording everything carefully so as to not "waste" words - while still providing enough detail that the story and characters are full enough - is most gratifying to me. Longer fiction (I've written multiple short stories and am working on a novel) is satisfying in other ways - the depth and complexity that the writer can achieve makes for such a rewarding writing experience (and hopefully an interesting read). WOW: Writing all types of genres have their challenges – and that is what makes them so rewarding when you can learn to write them well. If you could have dinner with one writer, dead or alive, who would you choose and why? Cheryl: Hmmm. Oliver Sacks jumps to mind, because he writes well about subject matter that I am intrigued with - but it's not fiction, so I suppose that doesn't count. Gosh, that's hard - I like many writers and poets, but have never claimed one as my favourite. When I read this (and after I shooed Oliver Sacks out of my brain) I pictured some strange and wonderful dinner party of Canadian women writers Margaret Laurence, Margaret Atwood and Alice Munro, along with Geoffrey Chaucer, Irving Layton, and Maya Angelou. I'd like to be a fly on the wall and just watch what transpires! WOW: What is the best piece of writing advice you’ve ever received? Cheryl: Possibly the best piece of technical advice I've received is not to "head hop" ... jumping POV from one character to another. But the most appreciated advice was that it's good to know the "rules" but to write in your own style, even if that means working outside of the rules. WOW! : Thank you for your fantastic answers! Congratulations again, and we hope to see more of your writing soon!